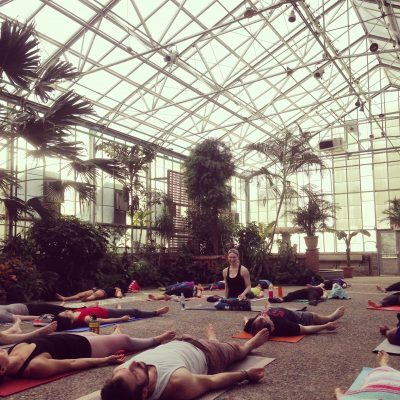 Join us for Bring Your Own Mat all-levels yoga classes led by local teachers at the beautiful Fairmount Park Horticulture Center. Classes are free for members of Fairmount Park Conservancy (learn more about membership here: http://bit.ly/1fIhUD0) or $10 for the general public. Membership helps support our work in Philly’s parks. Registration in advance is required. Fairmount Park Conservancy exists to champion Philadelphia’s parks. Our mission is to work as a collaborative partner to lead and support efforts that preserve and improve the parks and recreation system in order to enhance the quality of life and stimulate economic development of the Greater Philadelphia Region. We fulfill our mission by leading capital projects and historic preservation efforts, fostering neighborhood park stewardship, attracting and leveraging resources for the parks, and developing innovative programs throughout the 10,200 acres that include Fairmount Park and more than 100 neighborhood parks around the city. For more information, please visit myphillypark.org, join us on Facebook and follow us on Instagram and Twitter.